I started a project back in Nov 2014. I pulled it out of the shop and unveiled it to the world on Jan 2, 2015. My wife and four children, and myself have been following the tiny house movement for several years now. We purchased a 1984 Toyota Camper with a 22 R cylinder back in 2006. After, what I thought at the time were some serious renovations, we hit the road, traveling all over the east coast, primarily in the mountains year round. As the years past, our family grew from the two of us to the six of us. In 2013 my wife and I decided it was time to upgrade. So, we purchased a small early 70s pull behind camper trailer. I paid $50 for this trailer and upon returning home my wife referred to it as an Appalachian mobile meth lab (a man of questionable status had been living in it for some years). I immediately went to work tearing it down to the shell, I then framed up four individual bunk cots with custom portholes and dry erase boards, 2 secret storage compartments, ample 12 volt and 1-10 power, ample hanging storage, a large table. I then finished it out with bead boarding, floor to ceiling trim, and lots of burled walnut. When the project was finished I ended up with a bunk room for my four children. With all electric systems (no lp) for the safety of the children. A simple waste management system that allows the children to operate the toilet without risk of significant sewage problems. 🙂 Kids do the darndest things. I did no work to the outside of the camper, my wife still describes it as sketchy looking on the outside. But, upon inspecting the inside most people are taken aback. This response surprised me, and was rewarding and much appreciated. As I stood there admiring my job well done one day, my wife brought it to my attention that the four children she gave birth to had a comfortable and wonderful mobile retreat, while we were still in our 1984 Toyota camper that we had used for eight years, that was currently suffering from water and electrical issues. Hmmmm, okay I got the hint. In early November 2014 I pulled the RV into my shop and proceeded to attempt to please my wife. The interior is not completed yet, still needs wallpaper, trim, cabinetry (have not even started the kitchen yet). I made a deal with my business partner that I would have it out of the shop by the first of the year, plus my wife and I like to have the RV hooked up in Canaan Valley, WV by the first of the year to take advantage of the phenomenal skiing in the area. This is where both campers will stay until May 1. They will then be transported to a river home for the summer months (the interior will be completed in the spring). Quick run down of the vehicle, all of it’s structural elements as well as the skin and roof are aluminum, all structural elements are welded, overall weight of finished vehicle, unknown, however we guess-timate that we are 1500 lbs lighter than the initial factory unit. All windows with the exception of the door and the dome window are double paned, thermal insulated. 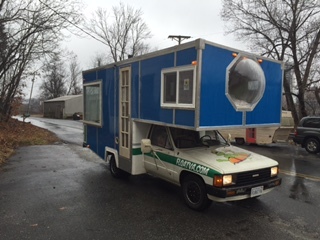 The large windows on the rear are tempered with a hurricane rating. It is insulated, with two layers of foam, one open cell and one closed cell with combined thickness of 2″ r value unknown. The wood-stove is a Danish stove that is enamel coated cast iron. All the heat affected areas in the ceiling are welded stainless steel with fire insulation. The roof has 6″ of drop from high side to low side, as you face the vehicle to allow the heavy snows to melt off without risk of water damage. As far as road performance, I extended the vehicles footprint roughly 2 feet off the rear and 3 feet off the front. The overhanging front compartment is self supported and very rigid. Surprisingly the vehicle has set new performance standards no longer swaying from left to right at speeds exceeding 60 mph, or bobbing front to back while breaking. She also set a new speed record of 70 mph on US -81 in route to Canaan Valley, WV. I’ve had at least four people tell me in the short time I’ve had it on the road to contact you so here it is. Our big thanks to Mason and his family for sharing! You can share this custom Toyota Motorhome Tiny Home with your friends and family for free using the e-mail and social media re-share buttons below. Thanks. If you enjoyed thisToyota Motorhome Tiny Home you’ll absolutely LOVE our Free Daily Tiny House Newsletter with even more! Thank you! Love that stove! The whole place looks ready to travel! Brilliant! As an owner of s 1985 Toyota pickup 4×4 with 22R EFI auto, what I’m curious is, how do you get the 22R to pull all that? and was 70 mph downhill with a strong backwind? also how much does the vintage trailer weigh? I like your critical thinking Nick S.
BTW, max r value of polyiso (http://www.polyiso.org/?page=FAQ) is 7; but in such a small space that not so little stove must make it like a sauna. Does it have its own air intake? Love it! And the trailer too!. You must send us some more shots of the interior when you get it finished. P.S. Have you thought of painting the trailer blue to match? I like what you have done; especially the windows. I hope to see more. this sounds like a great life experience for this entire family. very creative. you pull that traler with that truck also.. how big is that traler..
Nice job .you pull a traler with that truck also.. no problems..
Blue. Then you add a trailer. I hope you have the 6 lug 1 ton axle. If not, that thing is a death trap. You are overloading it towing that trailer. That’s good you made the coach lighter but that trailer weighs even more. I’ve had several Toyota motorhomes.